Implementation Here is my switchboard. I have hid border margins and other abilities so the user focus's on the switchboard and nothing else. 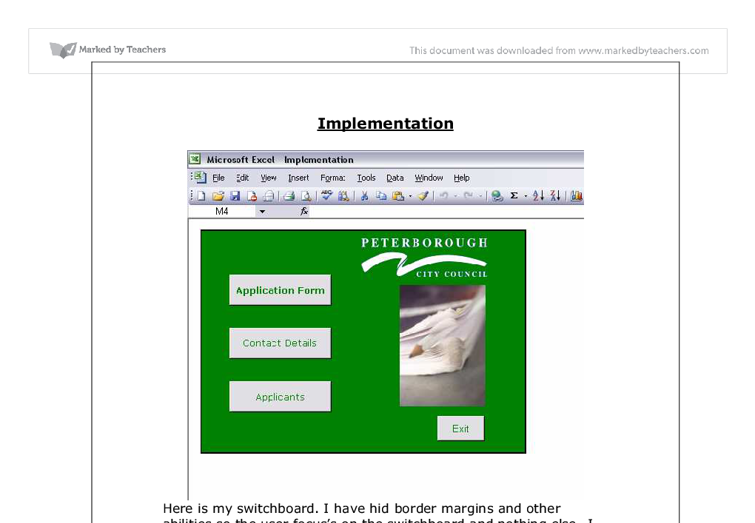 I used the main colour as green because the Peterborough City Council logo is usually green. I have created 4 buttons, which all use either a recorded macro or some VB coding. Here are the recorded macros: And here is the coding for my "exit" button on VB: When clicking the application form it goes straight onto my user form called "application form". ...read more. shown here: Here is some of the coding my user form (application form): For my next button called "Contact Details" on my switchboard I used a recorded macro. When pressed this button brings up another user form called "Contact Details" as shown here: I chose a user form instead of designing it on Excel itself because I thought it looked a lot more professional and presentable. I didn't use much VB coding for this, only for the "OK" button which then exits the user form. ...read more. There is 2 recorded macro buttons. "Back" goes back to the switchboard and "Print" prints a copy of the database. 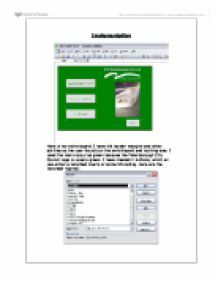 Information is automatically stored into this database as soon as the user presses send on the application form as already shown. I used simple VB (Visual Basic) coding to get the data to be layered row after row. Here is the coding for this: When pressing the "Exit" Button on my switchboard it closes AND saves the database and the whole program. As shown here: Overall I used a lot of VB, to edit and use codes to make my system work. ...read more.